The Yamasaki Y90 Fusion Splicer is the latest in fiber optic splicing technology from Yamasaki. It’s smaller and more portable design makes it ideal for use in FTTH applications as well as improving the ease of operation for everyday use. Designed to be easy to use in the factory or field – with minimal fuss, 150mm (L) x 150mm (W) x 135mm (H) and only 3.13kg! The Y90 Fusion Splicer package is accompanied by a full 12 month warranty for your piece of mind. See how much power remains at the press of a button. Battery can last for up to 180 Heat/Splice cycles per charge for portable splicing. The Yamasaki Y90 Fusion splicer is the latest in fiber optic splicing technology from Yamasaki. 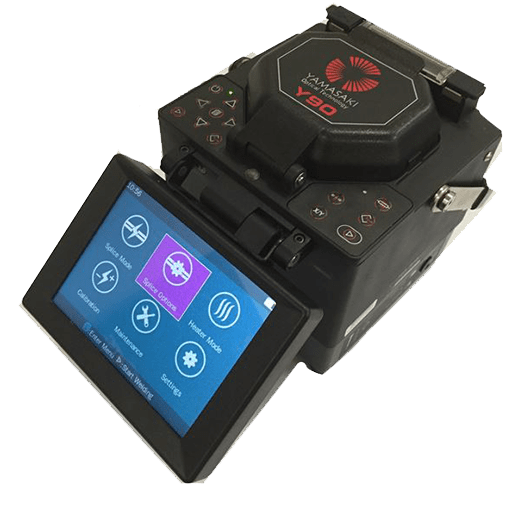 It’s smaller and more portable design drastically improve the ease of operation for everyday use and being battery powered the Y90 Fusion splicer is more portable than ever! The introduction of a full colour display further increases the everyday ease of use. The Y90 uses core alignment for the most accurate splicing. Typical loss of 0.02dB for Singlemode and 0.01dB for Multimode. Fast operation with 9 second splice times and 30 second heat times and a battery that can last for up to 180 Heat/Splice cycles per charge, the Yamasaki Y90 Fusion Splicer is the perfect addition to any Fibre Optic repair/installation kit. As a standard the Y90 also comes with numerous accessories including a Y17 Diamond Precision Blade Cleave tool to easily prepare the cable for splicing. The entire package also comes neatly packed in a handy transport and storage case.